Latin Burger & Taco – Miami, FL (@latinburger) – Food Truck Talk – Searching for the best foodtrucks! 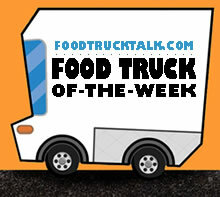 Congratulations to Latin Burger & Taco as FoodTruckTalk.com’s Food Truck Of-The-Week! We can argue for decades on what the best burger is. We all know the argument… is it In ‘n’ Out, Five Guys, or many others? Well, the argument gets quite a bit more heated in South Florida with the addition of Chef Ingrid Hoffmann’s Latin Burger & Taco food truck. Ms. Hoffman is probably familiar to you as the host of Simply Delicioso on The Food Network. She has extended her talent to gourmet street food with Latin Burger. (In September Ms. Hoffmann left Latin Burger, but the concept lives on). Ok, let’s get right to the burger – the Latin Macho Burger is a combination of three meats (Chorizo, Chuck and Sirloin) with oaxaca cheese, carmelized onions, and jalapenos with Ingrid’s special “avocadolicious” sauce (or if you are not as daring you can request red pepper mayo). 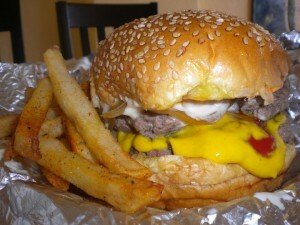 The reviews are in, this maybe the best burger… let the discussion begin! As the Latin Burger & Taco name indicates there are tacos as well. The Chicken Tomatillo has shredded chicken in tomatillo salsa topped with avocado, scallions and cilantro. Pulled Purk and the house favorite Chicken Mole are also on the menu. For special toppings be sure to try the hottie onions…. carmelized onions and jalapenos! Perfect on virtually everything! Ok, the food is pretty exciting. But so is the staff that is manning (and womaning) the Latin Burger & Taco food truck. It is combination of culinary students and some of South Florida’s homeless. The charity continues with some of the proceeds going to benefit the Amigos For Kids program whose mission is to educate children and families against neglect, abuse and poor diets. Latin Burger & Taco is a win-win situation. Perhaps the best burger you’ve had plus you’ll be supporting some of South Florida’s in-need population… all in one bite.